I think it was 15 years ago that I had an herb garden where my chicken run now stands. At that time I planted a small cutting of lemon balm. I didn’t know what to do with the stuff, I just thought it looked pretty and smelled wonderful — lemony but more like lemon grass than actual lemons. Every time I walked by the plant and disturbed the air around it, the rich lemony scent would fill the air. Since then, I’ve found the stuff is as invasive as mint. It looks a lot like mint. 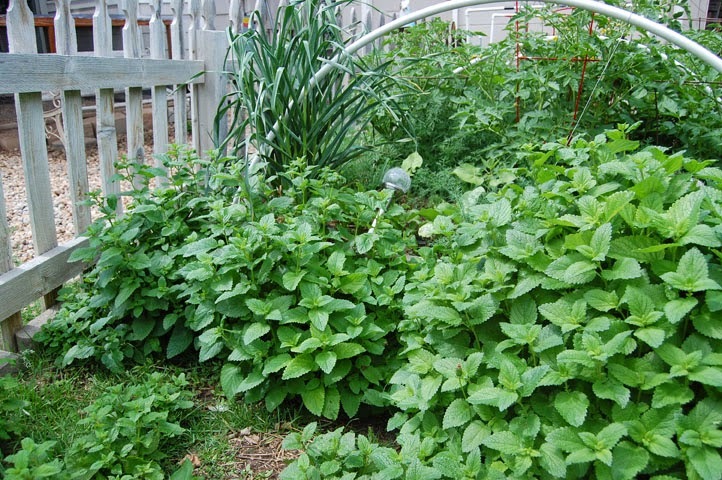 It’s actually in the mint family and when people visit my garden they always mistake it for peppermint. Lemon balm is also called Lemon Mint. Pests don’t seem to like it one bit, it doesn’t seem to need much water and it SPREADS. Lemon Balm is supposed to have calming properties, helps with insomnia, stress, digestive issues, colic in babies, menstrual pain, headache, toothache, Alzheimer’s… you name it. Apparently it will fix anything that ails you! I’m always in favor of natural calming remedies and decided to try making teas with my plants. For cold tea, I just take a bunch of the leaves, stem and all (about 2 cups, rinsed first of course), smoosh them into a ball and put that in a heat-proof container. Then I boil a kettle full of filtered water, pour the boiling water over the leaves and let it steep. If the leaves float to the top of the water, I put an upright stainless steel spoon on top of the ball of leaves and use it to weight them down. 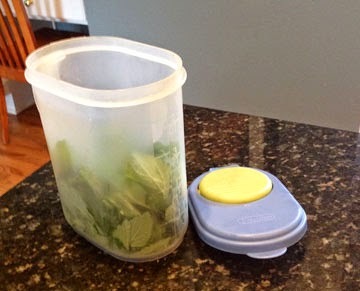 You can pull the wad of leaves out when the water cools down and use the tea right away or store in the fridge. It will keep for a couple of days. I love pouring this tea over a glass filled with ice cubes and a few drops of Stevia liquid. The hot tea almost tastes even better! Again I take some leaves, a generous tablespoon-sized wad, and put it in a mug. I add boiling water, let it steep for about 4 minutes and end up with a rich, fragrant, lemony hot drink. Very soothing and delicious! 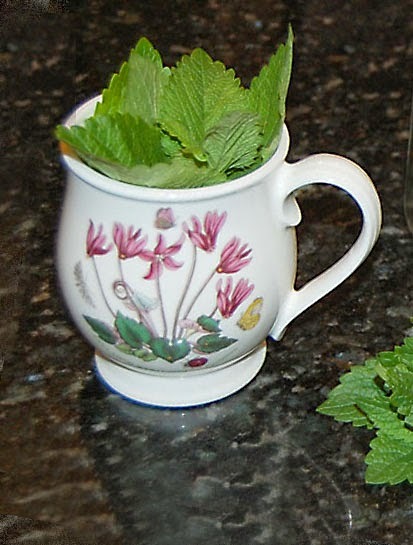 You could also add mint to the lemon balm for lemon-mint teas. 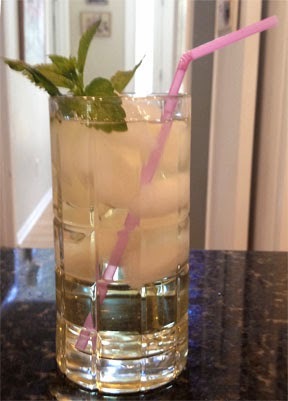 This entry was posted in lemon balm benefits, lemon balm cures, lemon balm tea, lemon mint on June 22, 2014 by Farmer Deb. 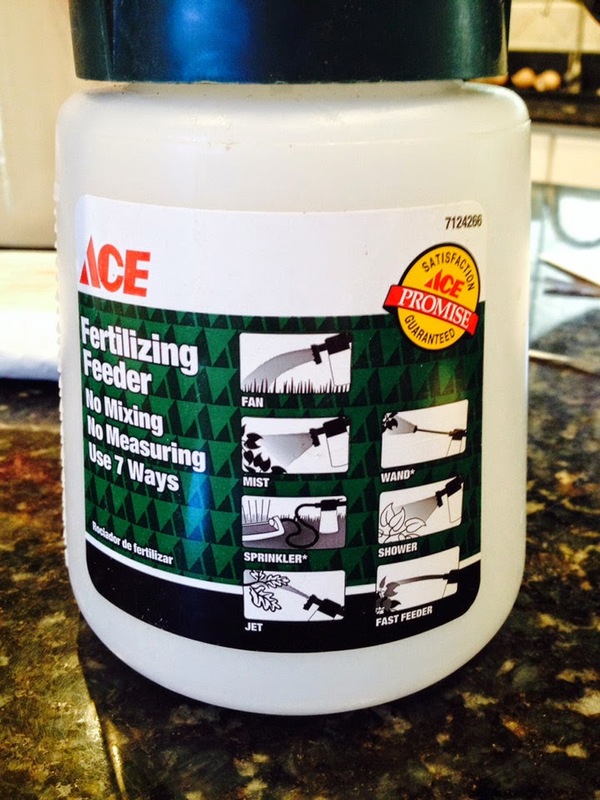 DIY Pet Safe Lawn Fertilizer: Does it work? The first person I ever saw using soap on her lawn was my Denver neighbor Mrs. Bassey back in the 80s. She was from England and had the nicest yard on the block. Mrs. Bassey would be out in her yard every few weeks with a lawn sprayer attached to her hose and filled with Ivory dish liquid. She said it broke up the clay and thatch on the ground and her lawn sure looked—and smelled—great. Around that time I came across a book by Jerry Baker, The Impatient Gardener, which contained a recipe for lawn tonic. I tried that a few times, but eventually gave way to convenience and went back to using store-bought fertilizers. It wasn’t until the past few years that I became more concerned with what exactly was IN those bags of grainy chemicals and what they might to do our pets, the wild animals visiting our yard and the environment in general. 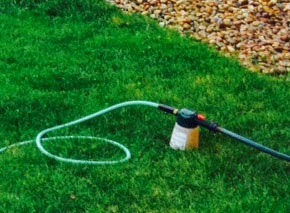 Put all ingredients into a one quart hose-end sprayer. I was able to get one from Ace Hardware (“Use 7 ways” says the label) that I could attach to a hose on the input side, another (short) hose on the output side and then add an oscillating sprinkler. 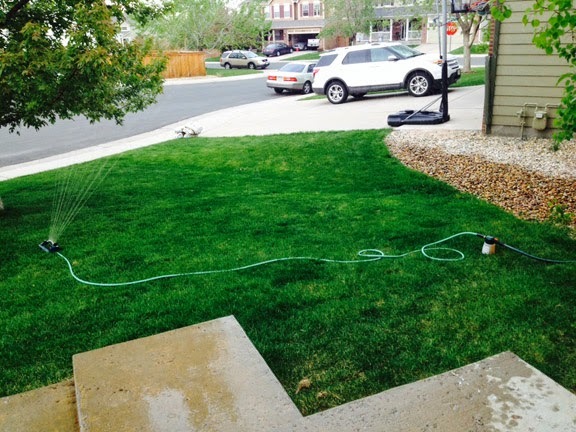 If you don’t have an extra hose or sprinkler you’ll just have to stand around for a while and spray your lawn by hand. The book says it will cover up to 2500 square feet and should be used in May and again in late June, but I don’t suppose it would hurt to use it more often if it’s very dry in your area. And of course don’t water during the heat of the day, it’s wasteful and you could scorch your grass. So does it work? I think so, my lawn looks great! I’ll keep applying this tonic throughout the summer and update this post if anything changes. Epsom salts: Magnesium sulfate (sulfur), a critical mineral for seed germination. Vital to the production of chlorophyll, which plants use to transform sunlight into food. An aid in the absorption of phosphorus and nitrogen, two of the most important fertilizer components. Sulfur, the other major component, is also an important plant nutrient. Contributes to chlorophyll production. Makes the primary nutrients (nitrogen, phosphorus and potassium) found in most fertilizers more effective. Mouthwash: Helps kills grubs and other grass-root-dining insects. Optional in my book. Dish Soap: Liquid dish detergent has surfactants in it that help the nutrients in the fertilizer stick to and be absorbed by the grass while leaving the grass unharmed. Adding liquid dish detergent to your mix of ingredients can help the ingredients work better. DO NOT use anti-bacterial dishwashing liquid as it will kill off important microbes in the lawn and soil that help “digest” thatch. It’s also a wetting agent and will help break up clay soils and improve water absorption. Ammonia: Rich in nitrogen, a nutrient that grass needs to be healthy. Beer: Rich in carbohydrates, beer provides an immediate source of energy for microbes in the soil, which then release energy for the grass to use. Soda: Carbohydrates in the sugar or high-fructose corn syrup used to sweeten them can make your lawn greener and more lush by feeding the bacteria that live in the soil. The bacteria produce nutrients that grass can readily utilize for energy. Only sugary, non-diet soft drinks should be used. 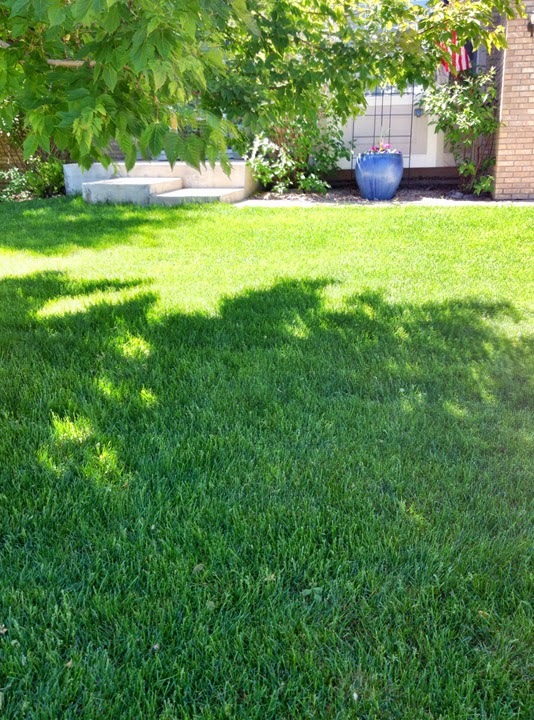 Here’s a healthy lawn ~ Cheers! This entry was posted in DIY fertilizer, homemade lawn food, lawn spray, lawn tonic, pet safe fertilizer, safe grass fertilizer on June 9, 2014 by Farmer Deb.